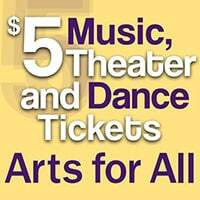 Show your Oregon Trail Card and buy $5 tickets to many of Portland’s best arts events! Q. Who can buy $5 Tickets? A. Anyone who gets food stamps through the Supplemental Nutrition Assistance Program (SNAP) and has the Oregon Trail Card. A. Two per Oregon Trail Card, but ask the group if you can buy more. Q. Where do I get $5 tickets? A. Contact the group. They will tell you where and when you can buy $5 tickets. Q. How do I buy the tickets? A. You must show your Oregon Trail Card at the time of purchase and pay with cash or credit card. SNAP credit on the Oregon Trail Card cannot be used to buy tickets. Q. Which events have $5 tickets? A. Check with the individual group (see right) to find out when their concerts are and if $5 tickets are available. Q. I don’t have an Oregon Trail Card. Are there other discounts available? A. Check out our listing of other free and reduced-price admission opportunities with dozens of arts organizations; visit www.racc.org/access. For organizations interested in participating in Arts for All program, please contact Pat Zagelow at Friends of Chamber Music pat@focm.org. For questions, please contact our office at info@racc.org. For more information about SNAP, visit the Supplemental Nutrition Assistance Program (SNAP) website. In January of 2011, twelve of Portland’s classical music organizations, operating under the auspices of Go Classical PDXand convened by All Classical 89.9, announced a pilot project called “Music for All” offering $5.00 tickets to SNAP (Supplemental Nutrition Assistance Program) card holders. Preliminary numbers for the six-month pilot program totaled 1,410 tickets used. Funding for the program was provided by the Regional Arts and Culture Council, Work for Art and the City of Portland. Plans immediately began to include additional arts organizations in the next iteration of the program and to expand it beyond classical music. The result, “Arts for All” was launched on October 3, 2011. Go Classical PDX is an association of classical music organizations in the Portland tri-county area that shares and coordinates resources to ensure the public’s access to and awareness of a wide range of traditional and alternative classical music events by breaking down barriers, real and perceived, to participation and by advocating the public good created by Portland’s vibrant classical music offerings. Go Classical PDX is convened by All Classical 89.9.